There are two epic sagas of ancient India that almost everyone is familiar with – the Ramayana and the Mahabharata. It’s hard to reduce either great story to a single line, but the Ramayana is basically the trials and tribulations of Lord Rama, who overcomes a scheming stepmother and assorted obstacles in his quest to be rightfully recognised as king. Meanwhile, the Mahabharata is the story of the five Pandava brothers and their long and bloody family feud with the Kauravas. Needless to say, both stories have a phenomenal cast of characters, including gods, demons, humans and animals, and employ more plot twists than you can shake a stick at. It’s not surprising, then, that when you travel across India, you’ll find several places where events from these great sagas took place. Part of the Ramayana takes place in Ayodhya in north India and there’s a crucial episode in what is now Sri Lanka. 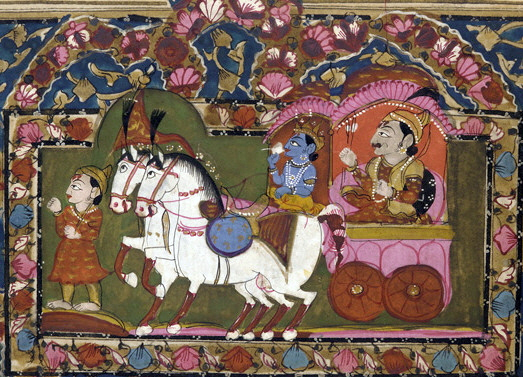 In the Mahabharata, the main action takes place across north India, more or less between Delhi and the foothills of the Himalayas. If you want to see where Kurukshetra, the battle to end all battles in the Mahabharata took place, you can find it in Haryana. Purana Qila in Delhi supposedly stands where Indraprastha, the capital of the Pandavas, was located. In the Garhwal district of Uttarakhand, where Himalayan Hideaway is located, the Mahabharata is hugely important. The Garhwali people consider themselves to be descended from the Pandavas, the good guys, more or less, of the saga. Do the Kauravas, the villains of the story, have any fans there? Oddly enough, they do! In the Tons River basin in the western area of Garhwal, near the border with Himachal Pradesh, you’ll find people who worship Karna, a tragic figure associated with defeat and death, and Duryodhana, a symbol of evil. In fact, local legend has it that Duryodhana was not killed at Kurukshetra and fled for his life to the Tons basin area. As for why he is worshipped, well, it has less to do with his unattractive traits and more to do with his power. As a being powerful enough to bring or withhold rain, Duryodhana is important for the local farmers. The Mahabharata lives on in the pandav lila, a local tradition of a ritual performance of some of the more martial episodes of the story. And we say ‘ritual drama’ because this is more than a folk drama – the performances are meant to please the gods and ensure that the crops grow, peace and prosperity prevail and disease and misfortune are averted. For nine nights, villagers across Garhwal sing, act and dance the stories that they know by heart. Himalayan River Runners, Himalayan Hideaway’s sister company, operates a camp on the Tons River between April and June every year. In addition, we organise many treks into the area mentioned in the Mahabharata, including a walk to the Duryodhana temple. We can also take you to Har Ki Dun, which has the Swargarohini mountain, the point where the Pandavas ascended into the heavens, as its backdrop. If you haven’t read the Mahabharata yet, we highly recommend it. Not only is it a fabulous story of good vs. evil, the characters and episodes resonate today across India. There are any number of versions around, some longer than others, and there are also TV adaptations for those who prefer seeing the action instead of reading about it!